Fieldbus has some pretty powerful lifecycle cost benefits. Significant cost reductions can be realized throughout the plant lifecycle, from engineering and design to operations and maintenance. More importantly, fieldbus is a great way to manage risk. At the Foundation we have numerous case studies of plant shutdowns and failures that have been avoided because of the diagnostic capabilities of FOUNDATION fieldbus and our ability to do control in the field device or actuator/positioner. Our latest white paper explains some of the more advanced functions of FOUNDATION fieldbus and how they can translate to dollars for your business. As a way to illustrate how these benefits can be achieved we examine some of the more advanced application and service offerings from Yokogawa, which is one of the largest FOUNDATION fieldbus suppliers and supporters. Much of what we discuss, however, is available from a wide range of FOUNDATION fieldbus suppliers and all their registered hosts and products can be found on our web site. Some of the topics we discuss include integrated plant asset management systems, device management applications, bulk downloading capabilities, how fieldbus engineering and design can actually save you money, and more. I came across an interesting article on the use of FOUNDATION fieldbus in a Floating Production Storage and Offloading project. I originally posted it to our LinkedIn group but I thought it was a good piece to also share with everyone on our blog. The article, by Suresh P. Nair, was featured in a web exclusive by InTech. The article explains all the benefits of having a “plug and play” technology that allows for quick modular connections of instrumentation in a very confined space. As we all know, space on a sea-bearing vessel comes at a premium so the smaller the footprint of your equipment, the more room for raw product. More raw product is the bottom line. In the LinkedIn group posting I linked above, Jonas Berge talks about what this type of installation means beyond just FPSOs. The overarching benefit here is with regards to the ability to modular construct FOUNDATION fieldbus projects. While the immediate benefits for this type of application on an FPSO is space savings, weight savings, diagnostics, cabling savings, ease of commissioning etc (you all know the extensive list of benefits of FOUNDATION fieldbus by now), the true benefits are something bigger. With the ability to modularly construct projects, easier project implementation on site greatly increases. Jonas points out that the ability to modularly construct a project allows the user to “reduce labor at the isolated site where resources are scarce, using manpower in the yard where resources are plenty.” There is a powerful message to be learned in that statement. I agree with Jonas that we’re not too far off from major mammoth projects being built offsite and shipped modularly for connection. We already see this type of thing happening across other industrial projects like major roadway/bridges and building construction. In fact, many of our regular homes are being built offsite these days with entire walls being pre-fabricated and delivered to site. As a side note I can’t help but be reminded of the story of a hotel just south of us in San Antonio that is sitting along the riverwalk that was build in a modular fashion for the Texas World Fair in 1968. It took only 46 days to “build” 496 rooms on the 21 story hotel. This month’s InTech has a great article about fieldbus project commissioning written by Augusto Pereira and Ian Verhappen. Augusto and Ian have done a lot of fieldbus projects and they have written a good book on fieldbus that is available through ISA at their bookstore. In this article they give some good tips on necessary equipment for your fieldbus installation, commissioning practices, and they have some interesting things to say about fieldbus network diagnostics. Key takeaways are you can save yourself a lot of time by investing in registered products, including cable, and follow a few simple rules to keep your installation painless. One of the things we try to do at the Fieldbus Foundation is put information into the hands of people that need it. We want people to learn how to do fieldbus the right way, from engineering and design to installation, maintenance, and operations. That’s why we offer free end user seminars around the world, our DesignMate segment design tool, and our numerous Fieldbus Certified Training Program partners. Perhaps our “best kept secret”, however, is our AG 181 System Engineering Guide. We recently revised AG 181, making this revision 3.2. You can download the latest version of AG 181 System Engineering Guidelines here. AG 181 contains the distilled wisdom of many of the world’s leading experts from those in the engineering and construction world to end users, systems integrators, educators, and suppliers. AG 181 offers many good pointers on how to do your fieldbus project right the first time. It is an essential part of the toolbox of any FOUNDATION fieldbus professional! If you already have the older version, this new version will look more streamlined and contains several new sections, as well as rewrites of old sections. One of our best kept secrets at the Foundation is our free DesignMate segment verification tool. DesignMate allows plant automation professionals to audit segment layouts in a user-friendly environment. The tool helps assure end users their fieldbus infrastructure will work with desired parameters such as cable length, number and type of installed devices, and selected power supplies. DesignMate allows users to perform rapid calculations, eliminate human error, improve efficiency, and minimize the amount of paperwork required during the segment design phase. Terry Blevins of Emerson Process Management has an excellent blog on modeling and process control. Hist post of August 8th has some interesting things to say about process gain and how it can be optimized with FOUNDATION fieldbus. Process gain is often called the “sensitivity of the process”, and shows how the PV reacts in responses to changes in controller output (CO). Blevins asserts that, from a process control perspective, process gain should be constant. Our first webcast with Control Engineering on designing your first fieldbus installation is now archived and available for download here. (You have to register first, but it’s fairly painless.) The design phase has a huge impact on the effectiveness of the fieldbus installation throughout its lifecycle, where the real cost benefits of the technology are achieved. Many first timers can fall into the trap of thinking about things in terms of 4-20 mA technology, and just because you have an engineering partner that may have done fieldbus installations in the past is no guarantee of success. Check out our webcast for tips on how to avoid these and other common mistakes and get the most out of your fieldbus installation. Next month Mike Miller from Duke Energy and yours truly will have another webcast on implementing FOUNDATION fieldbus in a modernization or migration scenario. Many end users are incorporating FOUNDATION technology into their modernization strategies. We will post details as they become available. There are many pitfalls to avoid when designing and installing your first fieldbus project. 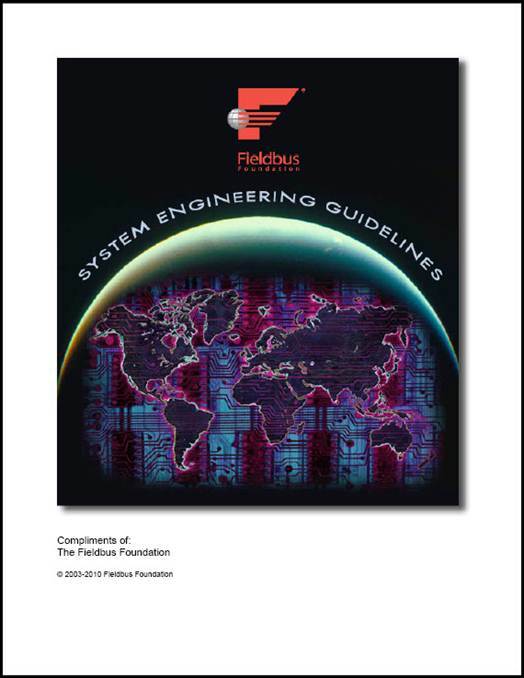 On Thursday, August 25, 2 PM Eastern Time, Fieldbus Foundation and Control Engineering will be hosting a webinar on how to design and install your first project successfully. Joining myself and Peter Welander of Control Engineering will be Dave Lancaster. Formerly of Bechtel, Dave is now one of our leading FOUNDATION Fieldbus trainers at Trine University in Indianapolis and is an active part of our Americas end user and sales force training seminars. We’ll talk about the human factors as well as segment design, training resources, and how FOUNDATION Fieldbus changes device commissioning. ControlGlobal Article by John Rezabek on "The Death of the Loop Drawing"
Good article from Chairman of our End User Advisory Council and contributing editor to ControlGlobal John Rezabek on the ambiguous future of the loop drawing. In these days of fieldbus and wireless technology, do old school paper loop drawings have a future?